The threat of climate change has become a concern among scientists, environmentalists and gardeners (who might wear all three of these hats, of course). In the search for solution to this problem, these three interested parties have common ground, as we explore in this column. As background, our climate is changing as a result of a disruption of the Carbon Cycle. On Plant Earth, a fixed amount of carbon cycles through different forms: liquid, solid, or gas. Carbon enters the atmosphere from several sources, including respiration of animals and plants, decay of animals and plants, eruptions of volcanoes, and releases of dissolved carbon dioxide (CO2) from the oceans. Plants absorb carbon dioxide (CO2) from the atmosphere, and use photosynthesis to release oxygen back into the atmosphere and convert carbon into sugars that support the plant’s above-ground growth. At the same time, up to 40% of the CO2 goes to the plant’s roots, to feed soil microbes. The microbes assist the plant to acquire nutrients through its roots, and lock (“sequester”) carbon into the soil for very long periods. 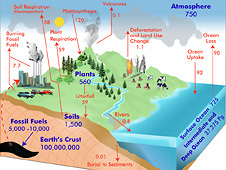 The Carbon Cycle supports Earth’s climate and enables the growth of plants and literally all other living things. In the diagram above, notations in blue indicate pools of carbon and notations in red indicate fluxes of carbon, both quantities are measured in petagrams. This complex natural process balances the amount of carbon in liquid, solid and gas forms. Vast amounts of carbon are stored in the soil and fossil fuels, and much smaller amounts are stored in the atmosphere, the oceans, and plants. During the Industrial Revolution (1760 to c. 1830), humans began burning fossil fuels, cutting down forests, draining wetlands, converting grasslands to large-scale crops, paving paradise, and applying synthetic chemical fertilizers and pesticides. These activities have been disrupting the Carbon Cycle and altering this important balance. The consequences include degraded soil with reduced ability to capture carbon, an excess of carbon in the atmosphere, the acidification of the oceans, and other effects, none of which are beneficial to living things (including us). The broad term, climate change, encompasses all these negative effects. Restoring the natural Carbon Cycle could reverse climate change. Restoration requires feeding the soil with organic matter and planting cover crops to protect the soil from temperature extremes and erosion. In short, the solution is based upon regenerative, organic agriculture. This strategy must be employed on a global scale, but we all should understand the Carbon Cycle and support this process of soil restoration in our own gardens and in our individual contributions to relevant public policy. Substantial private interests are invested in fossil fuels, “conventional” monoculture agriculture that depends upon synthetic chemicals, and other industrial methods that are changing our climate. They can be expected to resist this strategy of working with nature, so eventual success requires our vision and long-term commitment. Each gardener could participate first in his or her own garden. That would be a fine way to celebrate our independence from, in this context, commercial interests. Of numerous writings on this subject, Kristin Ohlson’s book, the soil will save us (2015), has been greeted with strongly positive reviews and praised by a reader of this column. The book is available in book stores and on Amazon.com, where enthusiastic comments include links to longer reviews and podcasts. A search of Amazon.com for “carbon cycle” also will produce a long list of books that clarify the relationship between this natural process and climate change. For quick access to info on the carbon cycle, search Google on this topic, and then choose “Images” to see many graphic representations of the process. For greater appreciation of living soil, I have recommended Teaming with Microbes: The Organic Gardener’s Guide to the Soil Food Web (Revised Edition, 2010), by Jeff Lowenfels and Wayne Lewis. This entry was posted in Essays 2015, Summer Quarter and tagged Book Review, Drought, organic, public policy, Soil, Sustainability by tomkarwin. Bookmark the permalink.